Carbrook Hall in Attercliffe dates back to the 12th century and has links to the Civil War and the siege of Sheffield Castle, plus a reputation as one of Yorkshire’s ‘most haunted’ spots. But its true glory was hidden by a scum of soot, beer and tobacco stains, with unsightly satellite dishes pocking the walls, after years of use a pub – and when arsonists struck last year there were fears it could be lost forever. The accumulated grime has now been scrubbed away, giving a better idea of how this grand Grade II-listed building, which is the 17th century stone wing of the original, much larger hall, might have looked in its heyday. Sean Fogg, of the developer West Street Leisure, estimates the total restoration bill will come to a cool £700,000, before Starbucks spends an estimated £280,000 decorating and fitting it out ready to open as a cafe in the late summer or early autumn. The stone-mullioned windows have been lovingly repaired, the coffered ceiling and ornate panelling downstairs have been cleaned and patched up, and the layers of Tarmac concealing its stone base have been removed so the grounds can be landscaped with grass and shrubbery. 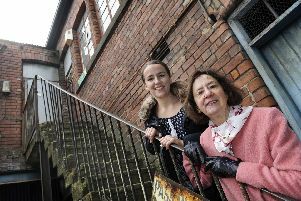 But campaigners who fought to save the building were most excited to see upstairs for the first time, where more panelling and an intricately carved fireplace grace what may once have been the bedroom of former owner Colonel John Bright, who played a key role in the taking of Sheffield Castle during the Civil War. Ron Clayton, of the Friends of Sheffield Castle, and Dave Pickersgill, of Sheffield & District CAMRA (Campaign for Real Ale) were shown round by Mr Fogg, with whom it’s fair to say they have not always seen eye to eye. Both men, who had grudgingly accepted that converting the building into a drive-thru Starbucks, while not their first choice, was the best option of preserving it for future generations, appeared impressed by what they saw. The pub was adorned with old photos linked to the building’s history, and a suit of armour, which Mr Fogg has had polished to a sparkle. He plans to place them in the panelled room upstairs, along with a board outlining the building’s history, and to invite community groups and schools to use the space. Mr Fogg, whose company also owns The Clubhouse and Bar & Beyond buildings, plus the old Cooperative Bank premises on West Street, which he hopes will become a bar or restaurant, is proud of what he has done with Carbrook Hall. “I’m overwhelmed by what we’ve achieved here. We’ve spent a lot of money bringing it back to how it was but we’ve saved it for people today and for future generations to enjoy. I’ve stood by my word and it’s going to look lovely,” he said. Carbrook Hall, on Attercliffe Common, close to Valley Centertainment, often features in lists of the region’s ‘most haunted’ places, with the ghost of Colonel Bright said by former landlords to be responsible for many mysterious goings-on. Mr Fogg said he had been down every day during the restoration and hadn’t seen or heard anything out of the ordinary, though he said believers in the paranormal told him they had felt a ‘strange presence’ there. His guests had little time for such talk, but when Mr Clayton joked that the ‘proof of the pudding’ would be whether Colonel Bright gave the facelift his approval, Mr Fogg replied ‘I’d love a visit from him'.